"Hallo Björn, thank you for the wonderful boat! 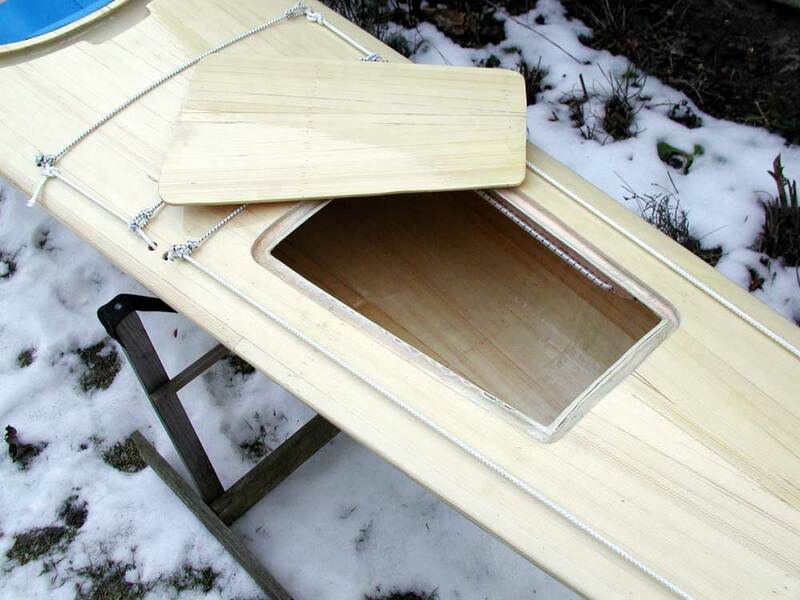 My wife and I build the kayak in October in Peenemünde with Ursula Latus. We had a lot of fun working with wood. The result you can see at the pictures. The clear varnish comes in December and the hatches we will build in June with Ursula. I like to make cut out - hatches with intern bungee for a great look - do you have pictures or a link for the best direction or angle of the bungees? Hallo Christian, congrats on a really nice-looking BP! 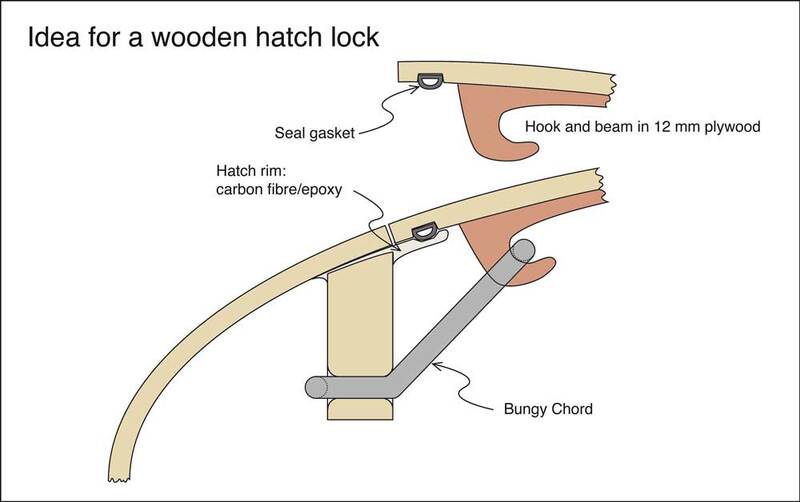 I have tried bungee hatch-locks on two kayaks, and I was not happy with either and removed them in the end. I know other builders have claimed they worked well, but for me they were hard to get really watertight (leaked when rolling), they were not as user-friendly as I would like and they required fingerholes or webbing loops to open – compromising the clean look. Anyhow, here is the idea, and here is my best effort – my old Hunter, which I later sold. On the Njord, I gave up and fitted nylon webbing across the hatches – not as nice visually, but reliably tight, reasonably maintenance-free and easy to use. They do work the best with strip-built decks. 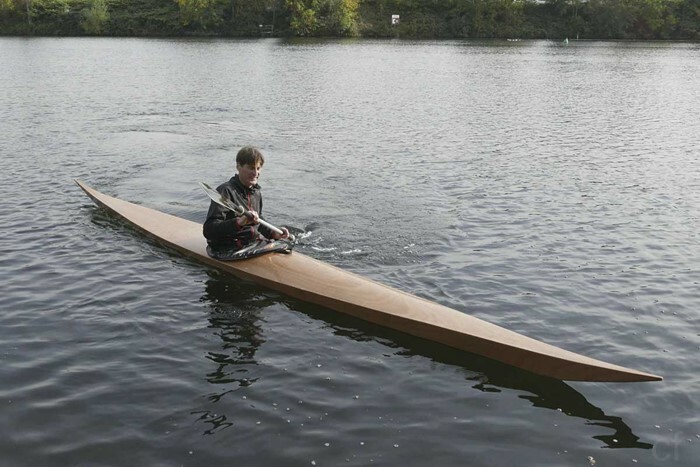 Your Black Pearl appears to be made out of plywood. When you make the curved fore deck with plywood you put stresses into it. When you cut out the lid it will spring back to a flat plate. The edges are no longer held by the rest of the deck and hull. Layers of glass applied to both sides of the deck will minimize the spring back but will not eliminate it. The thin glass will not offset the forces in the plywood. You can also brace the inside of the lid (as Björn showed in the link above) but it will be difficult to recreate the exact shape. If you wish to keep the clean lines of the decks I would consider a flush-cut internal bungee hatch for the aft deck only. I would install a small deck plate on the forward hatch for access and venting of the forward compartment. Looks great by the way!! You don't see a lot of bright finished Black Pearls. A little trick when cutting out hatch-lids directly from the kayak and being afraid that the shape will not be kept matching the rest of the hull as Dan explains is to glue the braces on the inside of the future lid before cutting out the lid. It takes some measurements to make sure the braces end up in the correct positions but should ensure the correct shape of the lid are cutting it out.